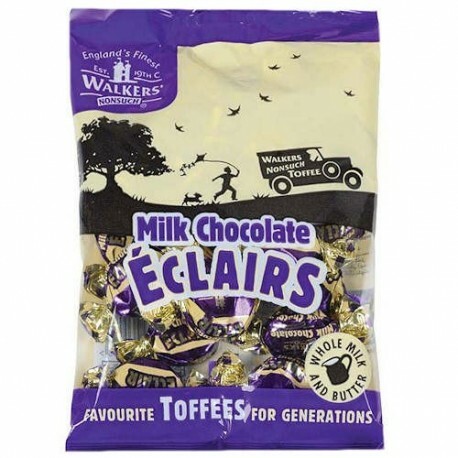 Walker's Nonsuch Milk Chocolate Eclairs - England's finest! 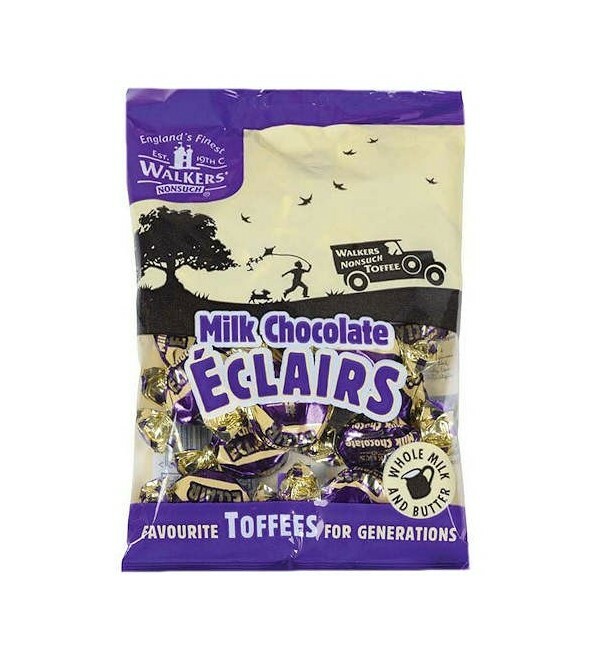 Walker's Nonsuch Milk Chocolate Eclairs - England's finest! From a tiny sweet shop in Longton, Stoke-on-Trent during the 19th century, Edward Joseph began making toffee for a handful of local customers. Using only the finest ingredients he created a unique recipe which is still used today. Ingredients - Glucose Syrup, Sugar, Sweetened Condensed Milk (from whole milk) 18%, Milk Chocolate 16% ((Cocoa Solids 31.3% Min, Milk Solids 17% Min) sugar, cocoa butter, whole milk powder, cocoa mass, anhydrous milkfat, emulsifier: soya lecithin, natural vanilla), Vegetable Oil (Sustainable Palm Oil), Butter 4%, Salt, Molasses, Emulsifier (E471), Flavourings. Ingrédients - Sirop de glucose, sucre, lait condensé sucré (à partir de lait entier) 18%, Chocolat au lait 16% ((Solides au cacao 31,3%, Solides au lait 17%) Sucre, beurre de cacao, lait entier en poudre, masse de cacao, matière grasse anhydre, émulsifiant : Lécithine de soja, vanille naturelle), huile végétale (huile de palme durable), beurre 4%, sel, mélasse, émulsifiant (E471), arômes. Peut contenir des traces de noix.